The 2-D neural maps combine visual clarity with a Web-based digital map interface, and users can view 2-D maps together with 3-D images. The program aims to better understand myelinated axons, which have been linked to pathologies such as autism. Results are published in IEEE Transactions on Visualization and Computer Graphics. PROVIDENCE, R.I. [Brown University] — Medical imaging systems allow neurologists to summon 3-D color renditions of the brain at a moment’s notice, yielding valuable insights. But sometimes there can be too much detail; important elements can go unnoticed. The bundles of individual nerves that transmit information from one part of the brain to the other, like fiber-optic cables, are so intricate and so interwoven that they can be difficult to trace through standard imaging techniques. To help, computer science researchers at Brown University have produced 2-D maps of the neural circuitry in the human brain. The goal is simplicity. The planar maps extract the neural bundles from the imaging data and present them in 2-D – a format familiar to medical professionals working with brain models. The Brown researchers also provide a web interface by integrating the neural maps into a geographical digital maps framework that professionals can use seamlessly to explore the data. David Laidlaw, left, and Radu Jianu worked with colleague Çağatay Demiralp to develop software tools that allow neuroscientists to examine 2-D and 3-D maps and images of the brain — and to share their work across the Web. Credit: Mike Cohea/Brown UniversityThe 2-D neural maps are simplified representations of neural pathways in the brain. These representations are created using a medical imaging protocol that measures the water diffusion within and around nerves of the brain. The sheathing is composed of myelin, a fatty membrane that wraps around axons, the threadlike extensions of neurons that make up nerve fibers. Medical investigators can use the 2-D neural maps to pinpoint spots where the myelin may be compromised, which could affect the vitality of the neural circuits. That can help identify pathologies, such as autism, that brain scientists increasingly believe manifest themselves in myelinated axons. Diseases associated with the loss of myelin affect more than 2 million people worldwide, according to the Myelin Project, an organization dedicated to advancing myelin-related research. 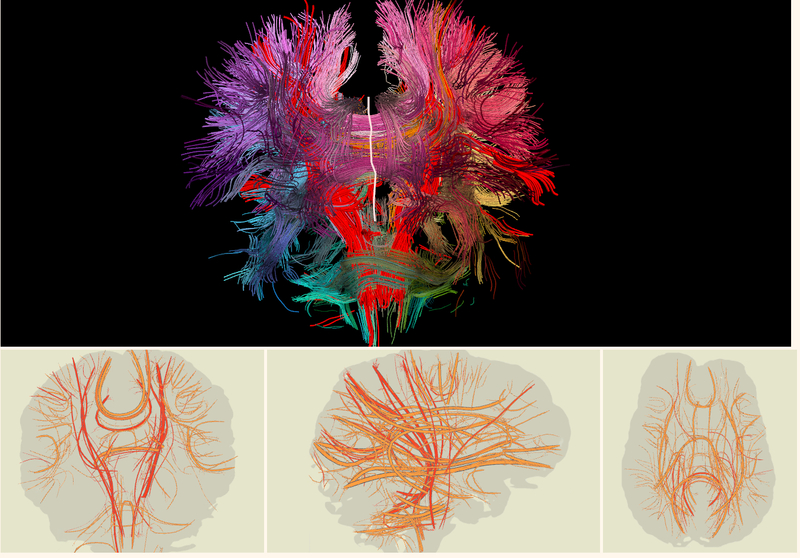 While zeroing in on the brain’s wiring, the team, including graduate students Radu Jianu and Çağatay Demiralp, added a “linked view” so users can toggle back and forth between the neural bundles in the 2-D image and the larger 3-D picture of the brain. Users can export the 2-D brain representations as images and display them in Web browsers using Google Maps. “The advantage of using this mode of distribution is that users don’t have to download a large dataset, put it in the right format, and then use a complicated software to try and look at it, but can simply load a webpage,” Jianu explained. The program is designed to share research. Scientists can use the Web to review brain research in other labs that may be useful to their own work.